What do you get when you combine pre-owned luxury watches with a donkey named King Kong? Creative genius—and an award-winning ad campaign. Congratulations to Barber Warren (formerly Drum Worldwide) for their upcoming feature in the June 2018 edition of Communication Arts magazine. 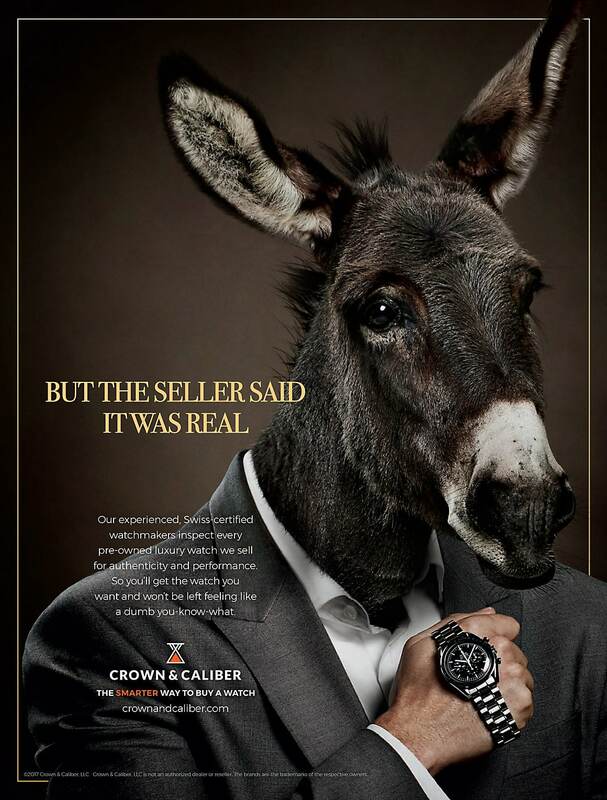 This print ad campaign for Crown & Caliber has received much deserved praise for Barber Warren’s skillful execution of personifying consumer fears—such as overpaying and buying a fake product through the use of animal heads on human bodies. We can’t help but have a ‘proud mom moment’ to see two Atlanta-based businesses that are both Roam members come together and create something powerful. Get a taste of the campaign by viewing their online feature and keep your eye out for the unveiling of the print publication this summer. Crown & Caliber. Established in 2014 in Atlanta, Georgia, Crown & Caliber provides “a uniquely better way to buy and sell the right watch at the right price with the right experience,” explains Chief Marketing Officer Jason Allen. Consider this online business like the Carmax of pre-owned luxury watches. Acknowledging a lack of transparency in a market with high dollar transactions, Crown & Caliber developed a solution that brings honesty and trust back into the equation paired with a great customer experience. In 2016, after recognizing their need to meet and work outside of the office, Crown & Caliber joined Roam. Serving as “an opportunity to pull away from having to manage the day-to-day of the business and focus on more strategic things,” explains Allen, most Fridays are blocked out on the calendar as scheduled “Roam Days.” Removing themselves from the office enables more strategic conversations and empowers their team to build confidence in making decisions. The partnership originated in 2016 when Barber Warren (then Drum Worldwide) was hired to create a brand beat for Crown & Caliber. As described by Warren, a brand beat is a “long term brand strategy and communication strategy that includes a brand personality statement and an adaptation of a style guide.” Knowing Warren’s team had a keen understanding of their brand, Allen called Bob back in 2017 when Crown & Caliber was ready to develop a brand awareness campaign. He wanted to create something that would stand out amongst the other predictable watch ads and knew Barber Warren to be established, good at creative direction and likeminded in their values. “We knew that we needed to stand out, and we knew that we needed to convey trust in a different kind of way,” expressed Allen. And Barber Warren was quick to rise to the occasion.